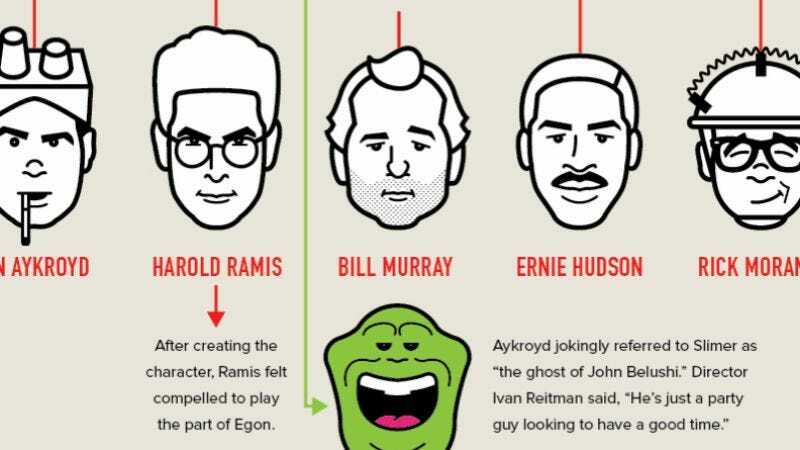 Ghostbusters nostalgia continues to sweep the Internet in the wake of the 30th anniversary of the first movie’s release, with this charming infographic by graphic designer Mike Seiders acting as the latest non-paranormal manifestation. The piece starts out with some discussion of casting (including the possibility of ‘80s-era Jeff Goldblum as Egon, which is a fascinating thought) before moving on to more randomized trivia about film locations and the movie’s practical effects. Put together from various Internet sources, there’s not much in the way of new information here (Paul Reubens was originally approached to play Gozer, Max Von Sydow’s voice was dubbed in for Ghostbusters II villain Vigo The Carpathian), but it’s a pleasant presentation that shows a lot of love for the source material.